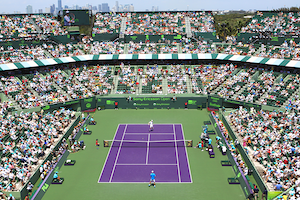 At the Sony Ericsson Open, Tomas Berdych and Robin Soderling claimed the remaining semifinal positions. Berdych pulled his act together against Fernando Verdasco to win 4-6,7-6,6-4. Conversely, Soderling expedited Mikhail Youzhny in straight sets 6-1,6-4. In the first set, after Verdasco survived a love-40 game, he worked his way to double break point. Verdasco broke for a 3-2 advantage. With that sole break, Verdasco went on to capture the first set. One of Berdych’s greatest issue was too mistakes on the forehand side. His initial game of the second set, Berdych dropped serve. Verdasco then rubbed out a break point to get to 2-0. But, as Verdasco served at 3-2, Berdych picked on his rival’s backhand to get to double break point. When Verdasco’s forehand landed long, the set was tied at 3 all. After double faulting to give Verdasco break point, Berdych maintained serve for a 4-3 edge. 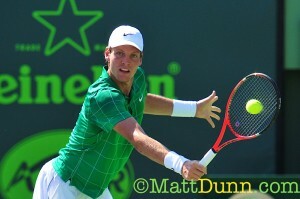 As the set progressed, Berdych found his forehand and forced a tiebreaker. In carrying the tiebreaker, Berdych sent the match into a third set. At 3 a piece in the decisive set, with back to back backhand errors, Verdasco faced double break point. With a spectacular backhand pass, Berdych secured the break for 4-3. After Berdych consolidated, Verdasco held at love to force him to serve for the match. With Verdasco’s forehand miscue, Berdych had double match point. Then, with a forehand winner, Berdych seized the victory. Tonight, Soderling raced through the first set taking it 6-1 against Youzhny. However, in the second set, Youzhny woke up, making it more compelling. After Soderling sprinted to a 3-1 lead, Youzhny held at love to keep the deficit to one break. The following game, Youzhny had break point and capitalized. Still, Soderling was too much for his rival. The next game, Soderling wrestled another break from Youzhny and consolidated for 5-3. Although Youzhny held at love, Soderling guarded serve to claim the match. Soderling and Berdych will square off in the semifinals. In their head to head series, Soderling leads 4-2. In doubles action, Leander Paes and Lukas Dlouhy defeated Nicolas Almagro and Tommy Robredo 6-3,6-0 to advance to the finals. Mahesh Bhupathi and Max Mirnyi beat Arnaud Clement and Jo-Wilfried Tsonga 6-4,6-7,10-4 in the quarters. Tomorrow, they will face Mariusz Fyrstenberg and Marcin Matkowski in the semifinals.